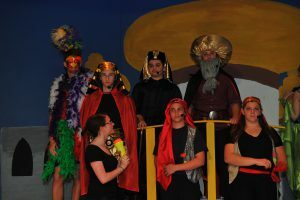 On July 14th, we performed the Kerem play, Aladdin. Over the course of the month, we have been working very hard to put together the production. Although there were a few technical difficulties, we pulled it off successfully. 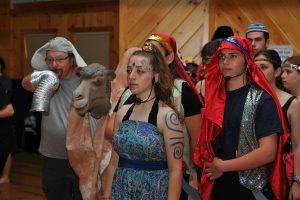 The whole camp thought it was hilarious and enjoyed watching it almost as much as we enjoyed performing it. After putting so much work into it, we were relieved it was over and were also extremely happy with the performance. We became even happier when we saw the amazing cake Deena’s mom made us for the cast party. One reason why we were so relieved the play was over was because of ZIMRIYAH (our camp-wide singing competition)! Because play practice took so much of our time, we were excited to have more time to prepare for Zimriyah. For the past two days we put all our energy toward Zimriyah and couldn’t wait for last night. We hoped to win, but were still happy with the results. Our main goal of the night was to have fun and appreciate our last Zimriyah together. We also loved the post-Zimriyah ice cream, which is one of our favorite camp traditions. We even got to see our madrichim (counselors) do their Kerem dance for us again! It was such a fun evening!